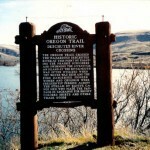 Subject: Point where the Oregon Trail crossed the Hazardous Deschutes River. 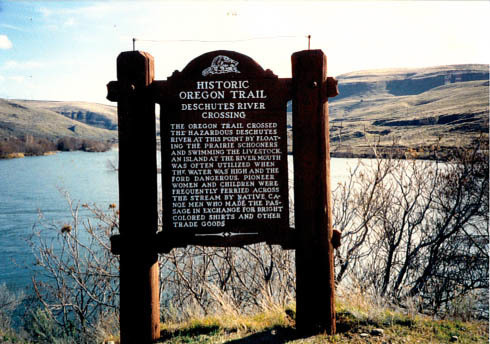 The Oregon Trail crossed the hazardous Deschutes River at this point by floating the prairie schooners and swimming the livestock. An island at the river mouth was often utilized when the water was high and the ford dangerous. Pioneer women and children were frequently ferried across the stream by Native canoe men who made the passage in exchange for bright colored shirts and other trade goods.